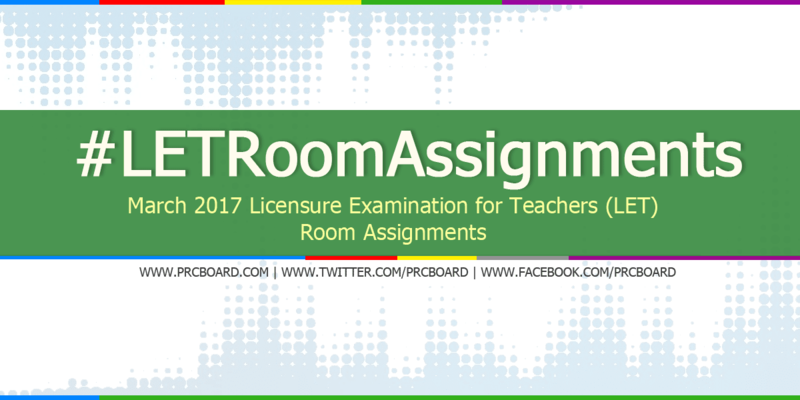 MANILA, Philippines - The Professional Regulation Commission (PRC) Board of Professional Teachers released the March 2017 LET board exam room assignments few weeks before the Licensure Examination for Teachers. The board exams for elementary and secondary levels are scheduled to take place on March 26, 2017 at PRC testing centers specifically in Manila, Bacolod, Baguio, Cagayan de Oro (CDO), Catarman, Cebu, Davao, General Santos, Iloilo, Legazpi, Lucena, Occidental Mindoro, Pagadian, Palawan, Pangasinan, Tacloban, Tuguegarao and Zamboanga. This page will be updated soon as room assignments at other above-designated testing locations are already available. You may go back to this page for updated info. For male examinees, plain white polo shirt with collar without any seal, logo or marks partnered with decent pants or slacks. For female, plain white blouse or shirt with collar without any seal, logo or marks partnered with skirt or slacks. As posted by PRC, examinees shall bring the following requirements on examination proper. The Notice of Admission (NOA), Official Receipt of Payment, Pencils No. 1 or 2/ Black ink ballpen, metered stamped mailing envelope, long brown and plastic/transparent envelopes and non-programmable calculator. The following are not allowed inside the examination premises: books, notes, review materials and other printed materials containing formula, among others; cellphones and similar gadgets; bags of any kind; and programmable calculators. Examinees are not allowed to leave the examination room, borrow anything and communicate with co-examinees during the length of the exam. Meanwhile, examinees are allowed to bring and eat their food inside the examination room. To receive regular updates about March 2017 LET board exam results as well as other related announcements, you may refer to our social media pages via Facebook and Twitter. May I verify when will be the release for room assignment at Bacolod? Hello po, ask ko lang din po kung kelan ilalabas yung room assignment prc manila? Mga isang linggo bago ang mismong exam! gud pm po.kylan po ang next fiiling po.tnx po. kilan po lalabas room assignment? Kailan yung schedule dito po sa Manila.....??? Kailan po available ang room assignment for Cebu? sa lucena po kailan lalabas ang room assignment? kailan lalabas ang room assignment sa pagadian??????? kilan lalabas po yung sa cdo?? Merun na po ba room assigment Tugue? Hello! Good evening po. Ma'am/sir, kailan po ba lalabas yung room assignment po sa davao citu? Thank you..
bkit d po lumalabas xa manila area? kla po lalabas room assign. sa baguio? Hilo.. Panu po. Wla any name q sa list of examinee.? Pano po kung wala ang name peo may NOA? Kasi po ngfile ako tpos wla name ko s baguio. WALA DIN PO NAME NAMEN..
bakit diko po ma click yung sa davao na room assignments? Kelan po yung room assignment sa pagadian city?? kailan po ilalabas room assignment sa CDEO? bkit po wala pa rin room assingnment sa baguio.kailan po lalabas. wala pa po bang room assignment ang Cagayan de Oro? How about your name is not found in the lists of examinee? kylan poh ang release ng room assignment s general santos city. wala pa rin po ba sa legaspi? Kailan lalabas ang room assignment sa General Santos City? Hello po kailan lalabas and room assignment as Davao City ? Pg dnka print ng online aplication pero ng bayad po.wla sa list of examinee. Mkka exam pa kaya..cnu po may idea dtu pls share..
bakit po ganun? bakit po wala po akong pangalan? blit po hindi ako kasama sa mag eexam this coming 26? nag file po ako nung january pa po bkit ngayon hindi ako kasama sa mag eexam??? yung name ko po nasa elementary nalagay eeehhh secondary major in mapeh dapat malagay ang name ko... paano po yan need help..
bakit hindi po namin mahanap ang room assignment ng prc general Santos? please let us inform po.. please..
nawawala yung mailing envelope ko makakapagexam pa ba ako?